Finally! 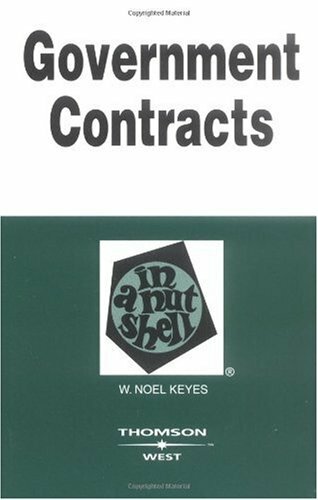 A plain-English presentation of the basic legal concepts of government contract law for professionals at any stage in their careers. Until now, anyone in the procurement field has had to trudge through dense and complex texts written in hard-to-followlegalesein their quest to understand procurement law. 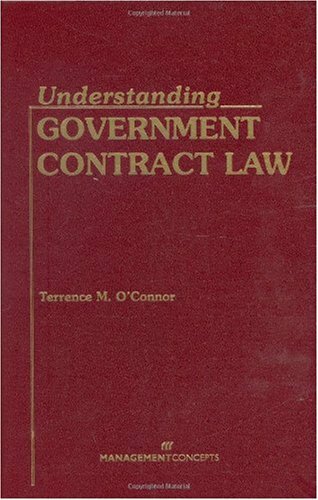 With Understanding Government Contract Law, they finally have a source of clear and concise explanations of the legal principles involved in government contract law, written by an authority on the subject. 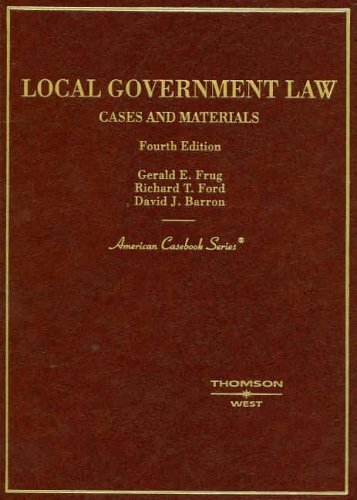 This textbook is definitely at the level of a law school student but also appropriate for contract administrators in the field of federal contracting.Understanding Government Contract Law provides some information that you can't get in the Federal Acquisition Regulation, namely how to sue the Federal Government.But hope you don't have to sue the Federal Government because the costs are onerous. Terrance O'Conner describes the role of the Contracting Officer better than anybody else in my opinion.He desribes the ways in which a contracting officer is a Judge, Sheriff and Plaintiff.Certainly the nation needs lots more contracting officers.This is an area of tremendous expected job growth. 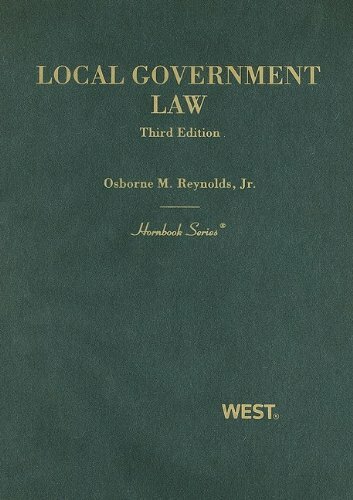 Many books on government contracting explain types of contracts in the two basic categories of fixed price and cost-reimbursement, which is correct.O'Conner focuses on the legal basis for contract formation, again necessary for contracting officers and contract administrators to know.One of the things that make government contracts different from commercial contracts is that the federal government can always get out of the contract if it perceives doing so to be in its best interests.This is well covered in the text. I found this to be a highly readable text in a very dry and challenging area of the law.I recommend it for aspiring contracting officers and contract administrators. Dr. Sandoz provides insight to the philosophical foundations of the American Founding. He points to several main influences including John Locke, Medieval Christianity, and Classical Philosophy. Sandoz shows the importance of political obligation as instilled through a sense of common moral virtue. He ultimately commends the common sense of the founders and shows us why other systems have failed. A key point is the differentiation found between religion and the secular matters of government. In stark contrast to "political religions" the founders set their sights on the obtainable goal of toleration and liberty without claiming to be able to perfect the world (marxism, communism). Overall, Sandoz rejects the secular interpretation of the founding and gives strong evidence that the founders valued religion quite highly and thought it an important foundation for society. He does not fall into the trap of finding a "single strand" of thought to explain the founding, but instead points to several key influences. Sandoz is able to make his case in common sense terms and offers humor throughout, while still maintaining a deep level of insight. I highly recommend this book for anyone interested in American Founding and especially the philosophical influences that brought it about. Recent controversies surrounding the war on terror and American intervention in Iraq and Afghanistan have brought rule of law rhetoric to a fevered pitch. While President Obama has repeatedly emphasized his Administration's commitment to transparency and the rule of law, nowhere has this resolve been so quickly and severely tested than with the issue of the possible prosecution of Bush Administration officials. While some worry that without legal consequences there will be no effective deterrence for the repetition of future transgressions of justice committed at the highest levels of government, others echo Obama's seemingly reluctant stance on launching an investigation into allegations of criminal wrongdoing by former President Bush, Vice President Cheney, Secretary Rumsfeld, and members of the Office of Legal Counsel. Indeed, even some of the Bush Administration's harshest critics suggest that we should avoid such confrontations, that the price of political division is too high. Measured or partisan, scholarly or journalistic, clearly the debate about accountability for the alleged crimes of the Bush Administration will continue for some time. Using this debate as its jumping off point, When Governments Break the Law takes an interdisciplinary approach to the legal challenges posed by the criminal wrongdoing of governments. But this book is not an indictment of the Bush Administration; rather, the contributors take distinct positions for and against the proposition, offering revealing reasons and illuminating alternatives. 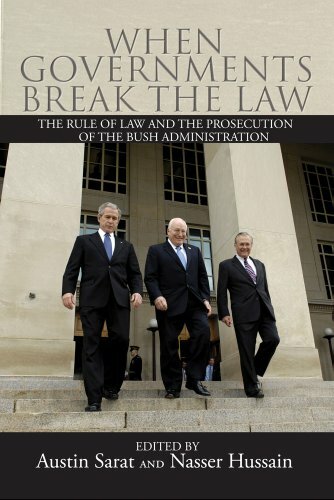 The contributors do not ask the substantive question of whether any Bush Administration officials, in fact, violated the law, but rather the procedural, legal, political, and cultural questions of what it would mean either to pursue criminal prosecutions or to refuse to do so. By presuming that officials could be prosecuted, these essays address whether they should. 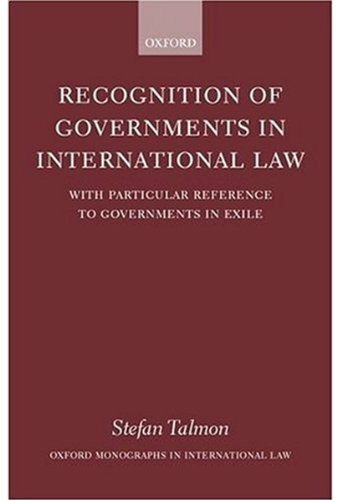 When Governments Break the Lawprovides a valuable and timely commentary on what is likely to be an ongoing process of understanding the relationship between politics and the rule of law in times of crisis. 1961, President John F. Kennedy signed Executive Order 10930, the first step in a long series of efforts to regulate the ethical behavior of executive branch officials. A few years later Lyndon B. Johnson required all senior officials to report assets and sources of non-government income to the Civil Service Commission. The reaction to Watergate opened the floodgates to more laws and rules: the Ethics in Government Act of 1978, subsequent expansions of that act in the 1980s and 1990s, and sweeping executive orders by Presidents George H. W. Bush and Bill Clinton. The consequence of these aggressive efforts to scandal proof the federal government is a heavy accumulation of law and regulation administered by agencies employing hundreds of people and spending millions of dollars every year. Ethics regulation has been one of the steady growth sectors in the federal government for decades. 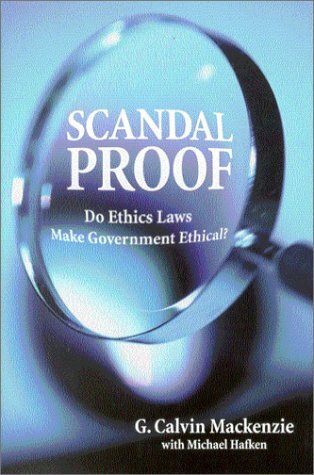 This book explores the process that led to the current state of ethics regulation in the federal executive branch. It assesses whether efforts to scandal proof the federal government have been successful, what they have cost, and whether reforms should be considered. Once upon a time, I felt that no one really had the truth with respect to ET/UFO phenomenon, that as Carl Jung, M.D. 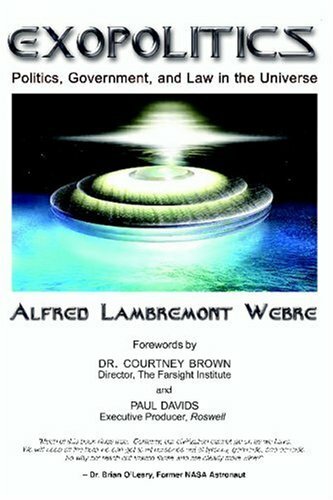 had said after he investigated the data 50-years ago, and I paraphrase, ... the UFO acts more as a thought from inner space than a craft from outer space. Then I read Yale lawyer Alfred Webre's book on exopolitics and the light inside my mind turned on; the universe is consciousness according to the cutting-edge physicists, thus, the outside of us and the inside of us can produce physical objects. I mean with no more than a thought we create a cascade of neurochemicals (molecules of mind) that control our attitudes, behaviors, our entire felt-sense experience of existence moment-by-moment. Indeed, I have written extensively on how shamans use this knowledge to shapeshift, heal, and walk between worlds. So why would not an advanced species employ consciousness itself as a vehicle of teleportation from one dimension, time or space, to another one at a higher, or lower, level of consciousness based upon matching a rate of vibration (frequency) within its own light body? If so, isn't that what the whole earth is doing in Solar Cycle 24, increasing the rate of vibration in the core of the earth, via our Sun's resonant connection, [think tuning-fork effect] to the black-white hole core star clusters at the center of the Milky Way Galaxy? Is this solar minimum we are in now in 2009 the quickening or prepatory phase that then triggers a new configuration of genes within our DNA? That is, there will be gamma-ray bursts of energy released in supernovas, solar flares and Coronal Mass Ejections (CME) forecast to increase dramatically in Solar Cycle 24 by NASA that could also be called by Christians the "rapture?" For myself now, I believe the answers are known and it's quite clear from reading attorney Webre's book, that he knows too; he is not speculating. He has collected the data, analyzed it carefully, weighed the evidence pro and con, and rendered a measured verdict: ET/UFOs are real and they are communicating with us via our mind's eye, telepathically, as well as physically in a way that bridges the gaps between our brain hemi-spheres and these multi-layered extra-dimensional realms of reality. This is what I suggest in my writings as a Science of Soul; the physics of metaphysics known by the ancients that constructed the sacred sites worldwide to open a portal of consciousness in us: The fifth dimension. These new insights of Webre will take us all ultimately to the outer reaches of inner space in era-2012 I'm convinced beyond a reasonable doubt whatsoever today. It is our divinely-ordained destiny to live, love, and laugh among the stars! But are we ready to face the facts in our solar system: Life exists on Mars in underground cities as well as in higher dimensional regions of the other planets too? Read the book before you decide; then spread the word of exopolitics: We are not alone, and never have been! What new crisis will the federal government manufacture in order to acquire more power over individuals? What new lies will it tell? Throughout our history, the federal government has lied to send our children off to war, lied to take our money, lied to steal our property, lied to gain our trust, and lied to enhance its power over us. Not only does the government lie to us, we lie to ourselves. We won't admit that each time we let the government get away with misleading us, we are allowing it to increase in size and power and decrease our personal liberty. In acquiescing to the government's continuous fraudulent behavior, we bear partial responsibility for the erosion of our individual liberties and the ever-expanding federal regulation of private behavior. This book attacks the culture in government that facilitates lying, and it challenges readers to recognize that culture, to confront it, and to be rid of it. Proof that our government is feeding us lies! that they are manipulating us with. Thank you, Judge Andrew Napolitano for this incredible book. It appeals to people of the left, right, and Liberty persuasions. It helps the average person to realize he is not free, because so many sacred American principles have been violated. At a recent political meeting, I recommended this book, and someone asked me, "How thick is it?" Meaning, "Just how much does the government lie to us?" I spread my fingers about 1 and 1/2 inches, and said, "But he just covered the basics!" No doubt the Judge could have written more. Another good chapter is Chapter #17: America has a free market. HA HA HA HA, that's a good one. Where to begin? Every market today is rigged. There are no free markets anymore, only interventions. Stocks, bonds, commodities, interest rates (the price of money), derivatives, real estate, health care, automobiles...you name it, government and large corporations are colluding to ensure markets aren't free. I could go on and on, but this is simply an excellent book, and very useful at shattering myths that the uninformed believe. Many people in our Campaign for Liberty chapter read and enjoy this book. Break the Matrix and buy it! And go Ron Paul! A Constitutional Literalist's point of view. A very interesting read.At first, I almost decided against reading it when I read on the back that Judge Napolitano occasionally sits in as Glenn Beck's backup host on his show.Since Mr. Beck is such a right-wing clown, I thought this book would merely parrot the typical ultra-right-wing doom and gloom grab-your-guns neocon rubbish.But I was wrong.Judge Napolitano's politics can best be described as Constitutional Literalist; whatever is in the Constitution is good, if it isn't and it is a law, then it is an affront to our freedom.I was quite surprised to learn that his criticism of government extends to any government which infringes on freedoms granted by the Constitution, regardless of political affiliation.In fact, quite the opposite from Glenn Beck, Judge Napolitano's harshest criticism is reserved for the Bush presidency and their passing of the Patriot Act, the single most egregious revoking of Constitutionally-protected rights in US history.He is equally critical of the Obama administration's apparent unwillingness to repeal the Patriot Act. The author takes us through 200 years of Constitutional amendments, Supreme Court cases, and documents each repeal of liberty incurred since the Constitution was signed.I found I agreed with most of his points, in all but 2 instances; gun control and anti-drug laws.Whilst I agree with Judge Napolitano that privately owned arms are protected by the Second Amendment, the Judge takes this much further.He believes the Constitution protects all arms, be they fully automatic assault rifles, handguns, or sawed-off shotguns, to him it makes no difference.He even goes as far as to suggest that the tragedies at Columbine and Virginia Tech could have resulted in a much lower body count had defensive weapons been permitted on campus.What that implies, of course, is that high-school teenagers should be given the right to carry arms to school, and I can't ever agree with Judge Napolitano on this point, nor can I think that is what the Framers had in mind.The Judge ignores the fact that in the 18th century, Americans were fighting for their survival.They had the British army trying to suppress them, the French army in Canada, the Spaniards and Mexicans to the south, and the entire country filled with North American Indians.Enshrining the right to bear arms in the Constitution was a very logical and necessary step.However, bringing a handgun to a high school in the 21st century is an entirely different matter.If American citizens want to have a defensive arm in their own homes, fine.But teenagers carrying them to school?It just makes no sense.The Judge envisioned a 15-year old boy calmly opening his locker, taking out his gun, and ending the slaughter.However, I see the ending entirely differently.What if 200 teenagers all went charging back to their lockers to retrieve their weapons and just started blasting away in the name of defense?What if someone shot in a panic, and then someone else returned fire not knowing who shot in the first place?I strongly believe allowing high school aged students the right to bear arms at school will result in a massive increase in the number of gun fatalities, Columbine would not be an isolated incident but a daily occurrence. That brings me to my second criticism.Judge Napolitano strongly believes the government has no right to control what Americans ingest into their bodies.I certainly agree in the case of terminal illness, there is no way the government should prevent citizens seeking any treatment they desire, experimental or otherwise.But allowing anyone anytime to ingest anything, including narcotics?He makes the point over and over that Americans have the right to ingest things which are bad for them, just as they have the right to be healthy.But I can't see how legalizing addictive substances such as crack cocaine could possibly be what the Framers had in mind.Crack addicts have virtually no control over their actions any longer, they will do anything to obtain their next hit.Now combine that with the right to bear arms by every citizen, regardless of age, or criminal activity.I picture a nightmare, the Judge apparently pictures a perfectly happy and free society of citizens respecting the Constitution. Nevertheless, this book is a great and informative read.And I have to give Judge Napolitano credit, he respects the Constitution in all matters, whether they may actually cause more suffering (see above) or were actually what the Framers had in mind, he is very consistent. 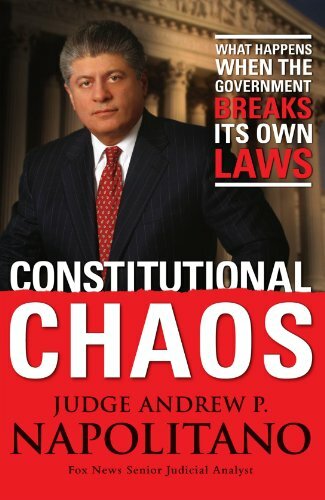 Andrew P. Napolitano, a state court judge from New Jersey, thinks our freedoms are eroding year by year and he uses the seventeen chapters of this book to incite us to respond by abolishing the federal income tax, eminent domain, the Federal Reserve System, and imposing term limits. Each chapter deals with a different lie that the government has told us, such as "All men are created equal," "Every vote counts," and "Everyone is innocent until proven guilty." The judge has an interesting perspective, and the book is well written, but some of his proposals don't make much sense. For instance, I have no desire to terminate the Federal Reserve and put its awesome powers in the hands of people like Barney Frank, Nancy Pelosi, etc. As someone once said, democracy is the worst form of government, except for all the others. It's no surprise that there are flaws in the system. The problem is, once you've identified a flaw, you also have to identify how to fix it in a way that won't make things even worse. Napolitano neglects that last part. Judge Napolitano is usually good value - persuasive, forceful, coherent and logical. Although this book is more about the vanishing Constitution than government lies, it does do a good job of cataloguing constitutional abuses committed by governments from the start of the Republic to the present. However, Napolitano does introduce a stunning lie, which is all the more stunning for being apparently uncharacteristic. He writes, "Mahmoud Ahmadinejad, the current President of the Islamic Republic of Iran, has called homosexuality an abomination, denied the Holocaust, and hopes someday to blow Israel off the face of the earth". While the first two claims appear to be more or less true, the final claim is a lie, and Napolitano, just like anybody else, can easily do the research online to check that it's a lie. Rulemaking is the single most important function performed by government agencies. 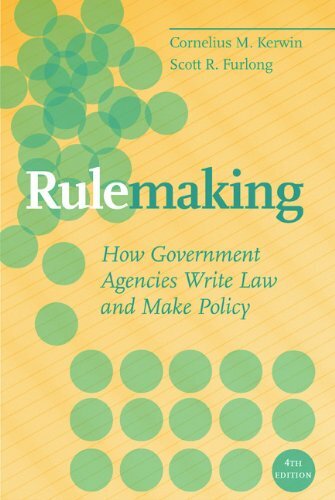 While Congress and the president provide the general framework for the governments mission, rulemaking fills in the details that define the law and delineate how each agency carries out its responsibilities. Cornelius Kerwin, and new co-author Scott Furlong, update this highly regarded text with new data, fresh analysis of interest groups participation in rulemaking, as well as coverage of the Obama administrations early actions, from executive orders and key personnel to agencies responses to changes. 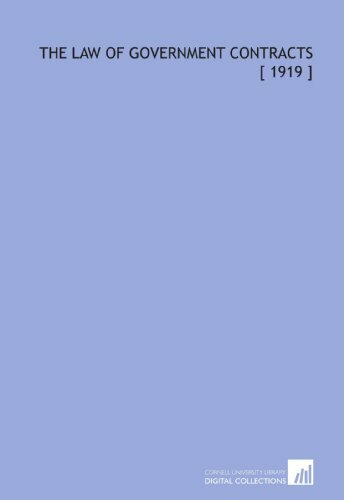 An invaluable and accessible guide to this intensely political process, Rulemaking contains the most current scholarship on a crucial yet understudied subject. 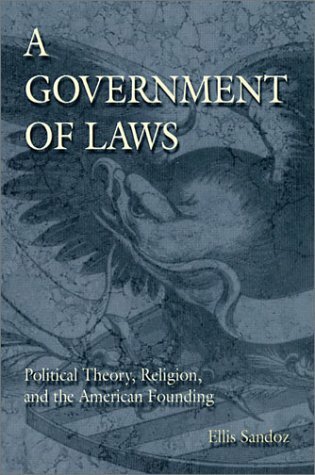 I am a graduate student at Jacksonville State in the MPA program and bought this text as part of the required reading for the one course I am taking.It is very helpful and easy to understand.I believe it will help with my further understanding of how government bureaucracies draft bills that can and do become law. I finished with more questions than answers. I am on an endless quest, it seems; to find a book on the administrative state that is informative while being at least mildly enthusiastic about its subject. This book starts out enthusiastic. This book certainly started with enthusiasm. The first chapter, in fact, is devoted to convincing us why the administrative state is a superb American invention (a view I do not always share!) Chapter 5, which is devoted to public participation in the Admin. state also bubbles with giddiness. Like a horse on crack-cocaine, though, this book stars with gallant speed, slows down fast and ends with an mild gasp. I'm sure this was not the authors intention. There are two main reasons. First, as the book is structured so that each chapter examines another area of admin. 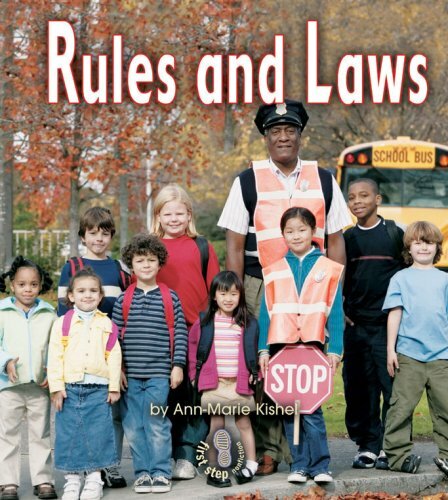 state rule making (oversight from the 3 branches, rulemaking structure, inherent paradoxes of the process) the first two chapters, which are almost overviews of the rest of the book, builds up high expectations. For example, when the first chapter lightly nibbles at rulemaking's structural issues, tow paragraphs in we are told that we will need to wait untill another chapter for a discussion. The author does this repeatedly throughout the book, thus leaving the reader in a constant hang. The second reason for the flickering finish of the book is that, and unfortunately as with most admin. state books, not much save for completely varied anecdotal information is offered. How are rules written, the book asks; it depends on the administration, it answers. What about modes of public participation and debate? Depends on the rules of the comission. After a while, its almost pointless to read the next chapter as we begin to guess the answer to each question posed. This book was written for quick reference only.I was not impressed. It was written well, but boring.I did learn from, but I wish I would have tried something different. Poorly edited, author strays from purpose of nutshell. 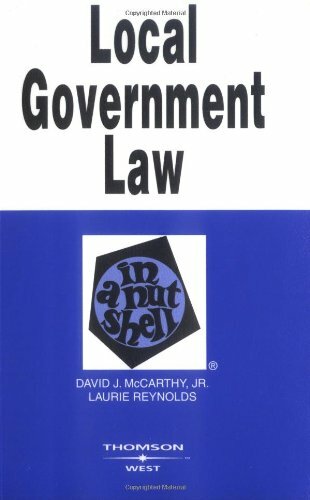 Nutshells are supposed to be simple, objective overviews of the law, but the author could not resist frequently inserting opinion and otherwise straying from the brief overview purpose of the text.The outline does not have any coherent structure.Lots of fluff, very little beef. Keep looking, don't buy this. In response to thereview about "spelling errors"
I am in Government Contracting and this book is very informative and can be used as a ver good tool. Also in reference to the review talking about spelling errors, I'm not sure how old your dictionary is but "definitized" and "estopped" are words. Check Merriam-Webster, Online m-w.com. The book is certainly packed with a lot of valuable information, and I suggest purchasing it if you plan on writing any government proposals, or managing government contracts.Just be prepared to filter through a lot of bad editing, spelling errors, sentences that make no sense, incorrect wording that render the sentence incorrect, and, at certain times, words that do not exist.For example, the word "definitized" appears many times; and I don't think the government has ever "estopped" invoking ceiling price limitations. It just seems unbelievable that a book in its fourth edition could be so riddled with obvious errors - especially in this day and age when spell checks and grammar checks are built in to even the most basic of writing and publishing tools. The fully updated 2008 volume is the 24th edition of the manual that lawyers, journalists and researchers have relied on for more than 25 years. 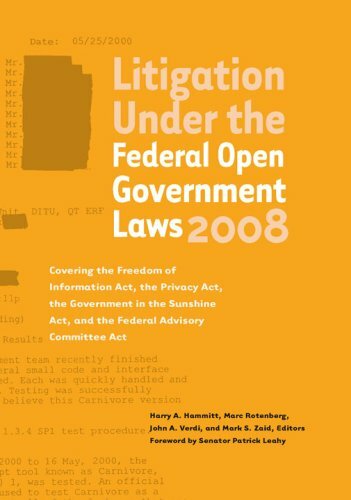 Litigation Under the Federal Open Government Laws is published by EPIC in cooperation with Access Reports and the James Madison Project. The book draws upon the expertise of practicing attorneys who are recognized experts in the field. The 24th edition includes updates concerning the OPEN Government Act of 2007, a revised chapter regarding litigation strategy, international open government resources, a glossary of key terms, and is updated with new significant cases. Appendices include a sample FOIA request, a sample request for expedited processing, and sample pleadings for the FOIA, the Privacy Act, and Federal Advisory Commission Act, and the Government in the Sunshine Act. Judge Andrew P. Napolitano is Fox News Channel's senior judicial analyst, seen by millions on The Big Story with John Gibson, The O'Reilly Factor, Fox and Friends, and other shows. His articles and commentaries have been published in the Wall Street Journal, Los Angeles Times, St. Louis Post-Dispatch, Newark Star Ledger, and other national publications. 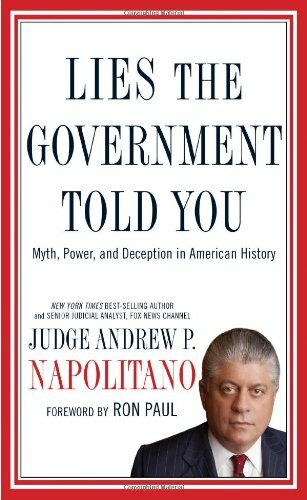 Judge Napolitano's book about how the government abuses its power is an absolute must read.You will never see the government in the same way again.Some of the things the government has done over the years are absolutely sickening, the Freedom movement is lucky to have Judge Napolitano in its corner. Is our government out of control? Judge Napolitano provides dozens of fact-filled stories showing how our government violates the law -- with virtual impunity.The details of the government's role in the massacre of helpless children held hostage in Waco, Texas is especially chilling.As unchecked government power expands, the rights of citizens are slipping away. This was the first of Judge Andrew Napolitano's books on the usurpation of the Constitution.In this book he introduces us to his philosophy as it evolved from GOP conservatism to libertarian individualism while serving on the bench in New Jersey.The book is 198 pages long with a text of the U.S. Constitution and the Bill of Rights and a short index.The book in essence described the court rulings that have allowed the government to take on a "do as I say, not as I do" brand of police justice that has led to numerous charges of entrapment and abuse of Fourth Amendment rights.As with his later books, Napolitano spares neither party as he attacked Bush's war policy after 9/11 and Clinton's use of force at Waco, Miami and Ruby Ridge.The debate of whether government has overstep its bounds might be up in the air for some, but for me there is no question that the misreading of various clauses in the Constitution has given the gang in DC maximum power. A five-star effort for the Judge's first book. I have not finished it yet and I am ready to get the pitchforks and torches, figuratively.In recent years, the government has been shaking my belief in government and I have been reading the founding fathers who considered government a necessary evil that must necessarily be kept in check to avoid it becoming a tyrant.Well tyranny seems to be here. But now reading the cases in this book...shows me it has been even more corrupt in so many ways for a long time. I can see now how ordinary law-abiding citizens can be falsely imprisoned and targeted by any government body that has an ax to grind, or even accidentally because of where you are or what you do.God forbid, you look like a likely suspect because the conviction rate is extremely high and none of us believe that is an accident or good detective work.Some of it is because they don't follow the rules we are expected to follow.Do I think that allowing some innocent folks to be in jail to be sure you have all the bad guys is ok?..NO! Thank God neither does the Judge!I am so glad I read this and I will read more of his works now.This must read is a stunning eye opener. 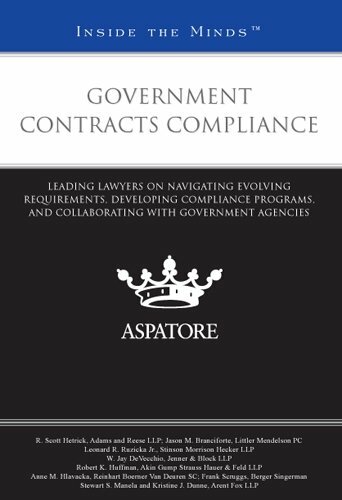 Government Contracts Compliance provides an authoritative, insider's perspective on best practices for abiding by the latest developments in government contracting. Featuring partners from some of the nation's leading law firms, these experts guide the reader through updating policies, filing and settling claims, managing investigations and compliance audits, and understanding the relationship between federal, state, and local contracts. From performance and quality requirements to accounting and employment verification procedures, these top lawyers discuss the critical compliance components in government contracts. Additionally, these leaders reveal their strategies for working with government agencies, creating client compliance programs, and avoiding common issues related to contract performance. The different niches represented and the breadth of perspectives presented enable readers to get inside some of the great legal minds of today, as these experienced lawyers offer up their thoughts around the keys to success within this ever-changing field. Inside the Minds provides readers with proven business intelligence from C-Level executives and lawyers (Chairman, CEO, CFO, CMO, Partner) from the world's most respected companies and firms nationwide. Each chapter is comparable to an essay/thought leadership piece and is a future-oriented look at where an industry, profession, or topic is heading and the most important issues for the future. Each author has been selected based upon their experience and C-level standing within the professional community. 1. R. Scott Hetrick, Partner, Adams and Reese LLP - ""Strategies for Compliance with Federal Contract Requirements""
2. Jason M. Branciforte, Shareholder, Littler Mendelson PC - ""Understanding How to Comply with Government Contracts""
3. Leonard R. Ruzicka Jr., Partner, Stinson Morrison Hecker LLP - ""Best Practices for Complying with Government Contracts""
4. W. Jay DeVecchio, Partner, Jenner & Block LLP - ""Developing a Compliance Program to Address Mandatory Disclosure""
5. Robert K. Huffman, Partner, Akin Gump Strauss Hauer & Feld LLP - ""Tackling Complex Requirements for Contract Compliance""
6. Anne M. Hlavacka, Shareholder, Reinhart Boerner Van Deuren SC - ""Government Compliance Issues: Be Positioned to Participate in Federal, State, and Local Procurement Opportunities""
7. Frank Scruggs, Partner, Berger Singerman - ""The OFCCP Seeks to Strengthen Enforcement, Engage Stakeholders, and Revamp Its Affirmative Action Requirements""